IEC 60335-2-76:2018 RLV contains both the official IEC International Standard and its Redline version. 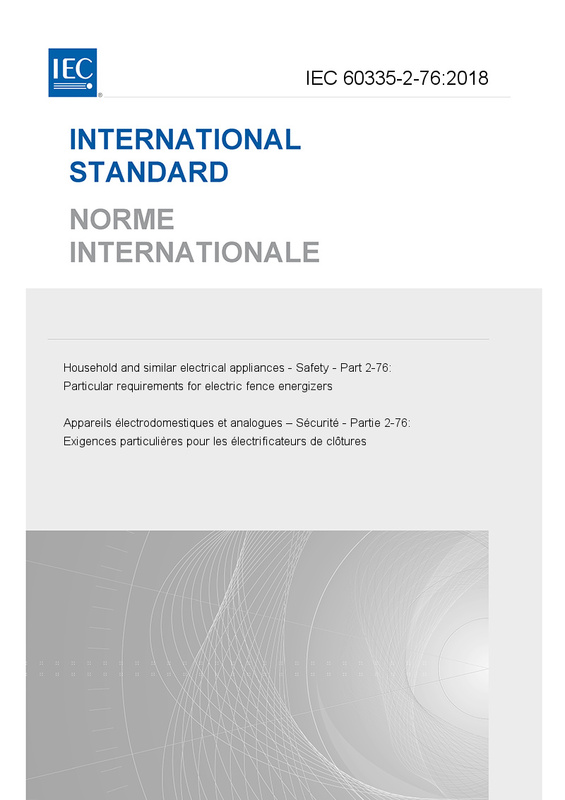 The Redline version is not an official document, it is available in English only and provides you with a quick and easy way to compare all the changes between the official IEC Standard and its previous edition. IEC 60335-2-76:2018 deals with the safety of electric fence energizers, the rated voltage of which is not more than 250 V and by means of which fence wires in agricultural, domestic or feral animal control fences and security fences may be electrified or monitored. Examples of electric fence energizers coming within the scope of this standard are: – mains-operated energizers; – battery-operated electric fence energizers suitable for connection to the mains; – electric fence energizers operated by non-rechargeable batteries either incorporated or separate. This standard does not apply to: – electromagnetically coupled animal trainer collars; – appliances intended to be used in locations where special conditions prevail, such as the presence of a corrosive or explosive atmosphere (dust, vapour or gas); – separate battery chargers (IEC 60335-2-29); – electric fishing machines (IEC 60335-2-86); – electric animal-stunning equipment (IEC 60335-2-87); – appliances for medical purposes (IEC 60601). This Part 2 is to be used in conjunction with the latest edition of IEC 60335-1 and its amendments. It was established on the basis of the fifth edition (2010) of that standard. This third edition cancels and replaces the second edition published in 2002, Amendment 1:2006 and Amendment 2:2013. This edition constitutes a technical revision. This edition includes the following significant technical changes with respect to the previous edition: – the text has been aligned with Edition 5.2 of Part 1; – additional requirements for security fence energizers have been introduced (Clauses 3, 7, 19, 22, Figures and Annex BB); – specific requirements for battery operated energizers have been moved to Annex S. The contents of the corrigendum of November 2018 have been included in this copy.